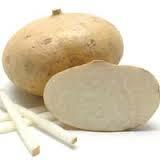 Jicama is a round root vegetable originally from the Mexican peninsula. It’s grown in Central America, the Caribbean, the Andes and South Asia, where it’s a valuable food source. Its texture is similar to a turnip, but the taste when raw is more like an apple. The skin is tough and needs to be peeled. It’s high in fiber, and helps promote good bacteria in the gut. It’s also a valuable source of vitamin C, and includes some B vitamins, potassium and other minerals. Since it’s low in calories, it’s a great food to snack on. 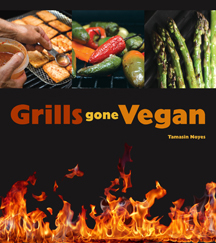 This recipe is from Grills Gone Vegan, by Tamasin Noyes, reprinted with permission. Yield 6 servings. Advance prep: Marinate the jicama for 1 hour. To prepare the jicama, put the tamari, vinegar, oil, and liquid smoke in a 13 x 9-inch nonreactive baking pan and stir to combine. Add the jicama and turn to coat. Let marinate at room temperature for 1 hour, turning the jicama occasionally. To prepare the topping, put the beans, carrot, chile, onion, vinegar, garlic, oil, tamari, and oregano in a medium bowl. Stir gently, taking care not to crush the beans. Season with salt and pepper to taste. To grill the jicama and assemble the rounds, preheat a grill, grill pan, or electric grill to medium-high heat. Put the jicama on serving plates and top each round with a heaping ¼ cup of the bean mixture and a few pieces of the avocado.